Does speculation hurt bitcoin? 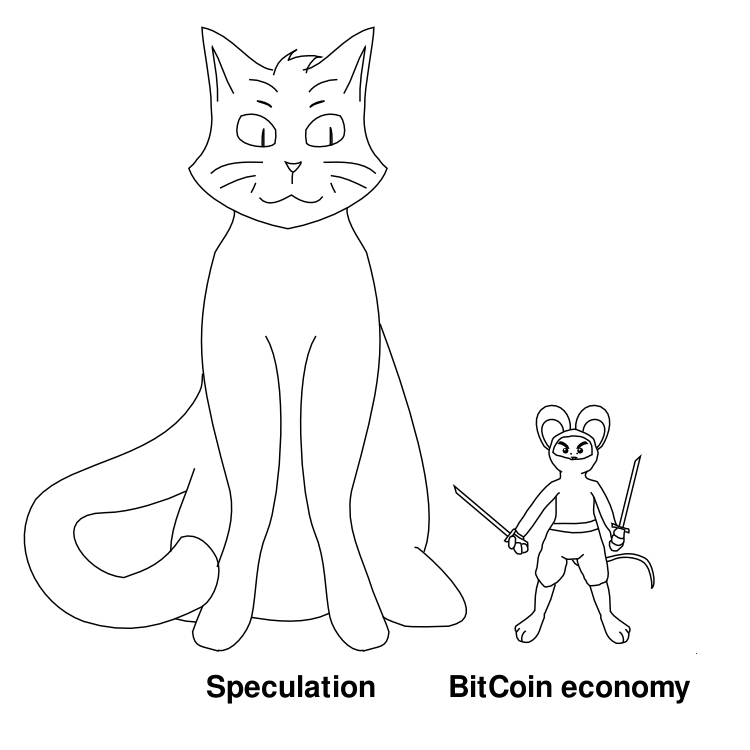 I often hear people complain that speculation is destroying Bitcoin, or that Bitcoin will fail because of speculation. Is there any merit to this criticism of Bitcoin? And in particular, is the idea that speculation is hurting Bitcoin any different then the idea that hoarding is hurting Bitcoin? It's worth noting that bitcoins would have no value if it weren't for speculation. When Satoshi first released the client, those who put their electricity and computing resources towards mining bitcoins were speculating that the value would rise from zero, and that the coins would be accepted as payment by someone else. Those who first accepted bitcoin payments, likewise, were speculating that the value would remain above zero, and continue to be accepted by others, and so on. It's also worth noting that Bitcoin would likely not have received the amount of attention that it has if not for people speculating that the value would rise tremendously and buying coins in large quantities. This attention has brought in more users, developers, and businesses, thus increasing the health of Bitcoin. If speculation does hurt Bitcoin in some ways, it's at the very worst a necessary evil. Theoretically, in a perfect world, speculation would reduce volatility. However, that assumes that all actors are rational and have equal access to useful information. There really is no useful information about the future value of a Bitcoin. The future demand could be near zero (if Bitcoins become obsolete or are never widely adopted) or massive (if Bitcoins become popular, since their creation rate cannot be changed). As a result, speculative bubbles are created frequently. The price shoots up for a day or so, and then when the bubble bursts, panic selling sets in. This creates exaggerated increases and decreases in the price. Also, for every savvy person who makes money on this volatility, there's a naive guy who lost some money. That probably turns a lot of people off as well, but most likely what it turns them off from is speculating. But this actually does hurt Bitcoin adoption. One of the obstacles to Bitcoin adoption is volatility. It's hard to sell a product for X Bitcoins if the value of X Bitcoins can change drastically from day to day. A merchant could be forced to hold a large number of Bitcoins waiting for the prices to recover as their suppliers and employees expect to be paid in dollars. The price of Bitcoin dropped from $11 to $9 in a day (8/25/2011), and stayed below $7 for a month. Imagine a merchant who accepted Bitcoins at $10.50 each and found them at $9 the next morning. Do they wait and just hope the prices go back up? I should also point out that this doesn't mean speculation is "bad". It does, however, have some effects that may reasonably be considered bad. These reasons also are somewhat unique to Bitcoins -- these issues don't apply to speculation in more predictable commodities like oil which actually tends to reduce volatility. The whole point of money is/was to provide a stable and diversely exchangable store of value. We now simultaneously inhabit a global, national and local community within which to trade. So lets value the world. Each country presently has a share of the global pot which is represented by the relative value of its currency. So call this day one. Set the median point as the value of our 'standard' (call it the Bitcoin if you like). The standard will only move if value is added or subtracted from the whole world economy. But the relative value of individual currencies will move coz as one countrys fortunes improve their currency will evaluate against the standard, while anothers will fall to compensate. Now you have a 'standard' that is immune from significant inflation/deflation, while still allowing people to speculate on any individual countrys relative performance against the standard or each other. This will encourage international competition, leading to economic growth. The whole point of gold as a standard was to establish that global 'fix' while providing a base for relative local commodity value. We now have the info to move away from archaic gold, plus stop local governments cooking the books....the numbers can do the job far better and be totally transparent. I would also like to add, that future bitchains will award less bitcoins, and technology advances will require greater investments from miners, hence requiring at least at some point in aggregate, a recoup of these investments and hence exchange of bitcoins. If the bitcoins can be exchanged for upgraded hardware, all the better. It will also be interesting to see how bitcoins can be balanced between spent and saved by individuals. Sure the US dollar can be saved, but due to inflation it is better to spend it. Gold is better to save, because of inflation, be its hard to spend. It will be interesting to see if and how CombiBars can be used to promote gold to a spend format, and perhaps this is necessary, because if bitcoin was really to take off as a widely and world wide accepted format, perhaps gold will again become a barbaric relic. Not the answer you're looking for? Browse other questions tagged economics speculation or ask your own question.